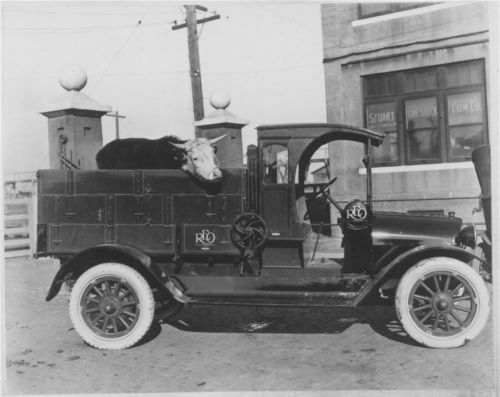 This black and white photograph shows an animal standing in the bed of a REO delivery truck, parked in front of the Stuart Livestock Commission Company in Wichita, Kansas. The REO initials stand for the REO Motor Car Company and it's founder Ransom Eli Olds. Located in Lansing, Michigan, the company manufactured the light delivery truck from around 1905 to 1936.